Long before she fell off a horse, Madonna was part of what might be the paparazzi-celebrity showdown that started it all. 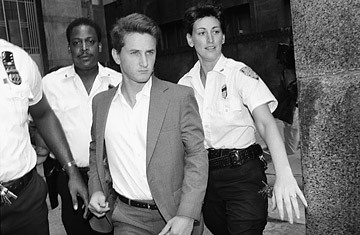 Back in 1985, up-and-coming actor Sean Penn tried to protect his then-fiance (the Material Girl herself) from two British journalists trying to snap photos of her morning jog. It got ugly. "He went for us like a madman," reporter Ian Markham-Smith said of Penn's behavior. "He went berserk, like a whirlwind." "He said, 'No pictures  you take my picture and I'll break your back with this rock," the other tabloid reporter added, before explaining how Penn made good on his promise and beaned him with the aforementioned rock. The actor ended up paying a $100 fine for two counts of assault and battery, thereby sealing his reputation as a Hollywood bad boy.